Yom Kippur is upon us in a few more hours, with its 25-hour fast. The hardest thing about fasting is knowing that you can’t eat. That’s when everything starts to sound appealing. Well, nearly everything. There are still some things I wouldn’t want to eat even if I’d been fasting for days (well, or so I imagine). Things that even can raise your motivation to fast. 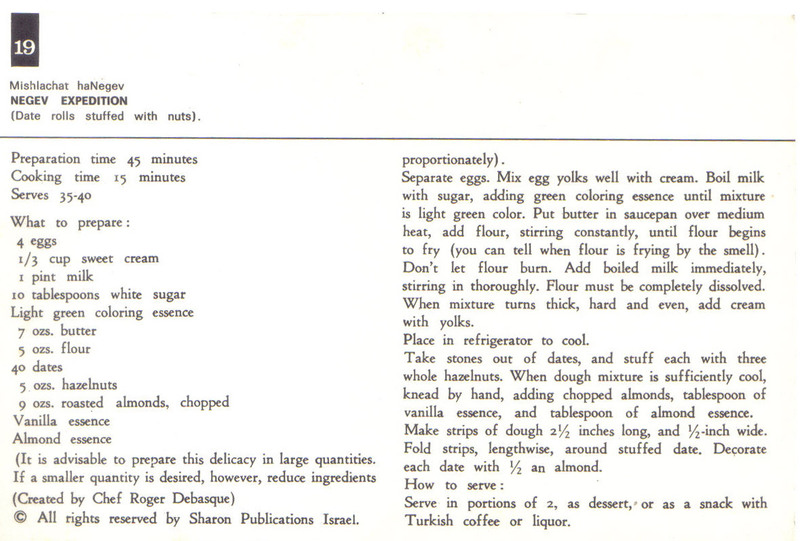 A few weeks ago, we happened to receive this collection of vintage “Israeli” recipe cards from the 1970s, “recipes exclusively selected from Israel’s international cuisine,” “selected recipes ‘mama’ never heared about” (misspelling and strange punctuation from the original). 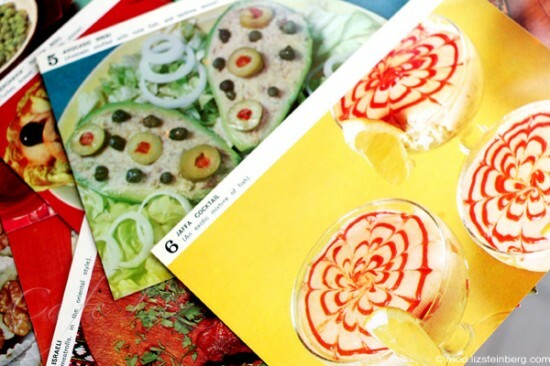 My friends Rena and Irene perused them, hysterical giggles interspersed with gasps of horror, and suggested that these recipe cards would make excellent Yom Kippur cards, to get friends into the fasting spirit. So I have them to thank for the idea. Indeed, I don’t think my mother ever heard about the Jaffa Cocktail, which is made out of fish (“an exotic mixture of fish”), nor did she ever think to make something like the Avocado Sinai, which is avocado stuffed with canned tuna and tehini. 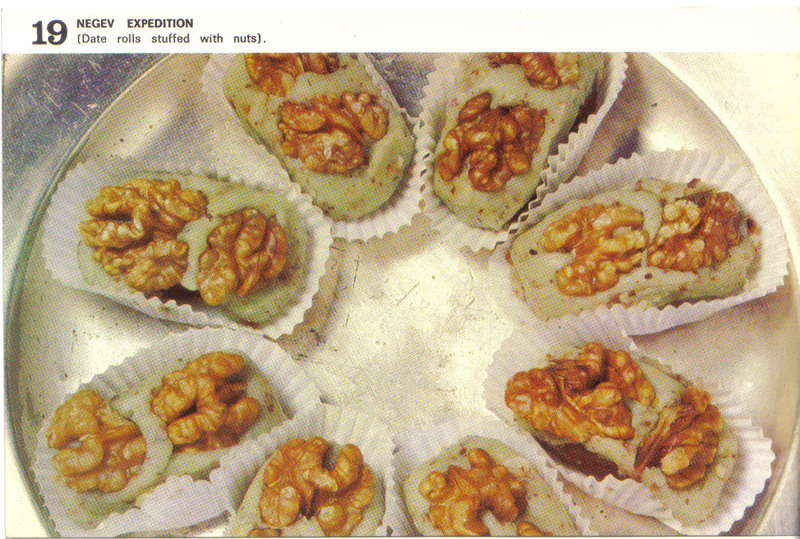 Other recipes include things with names like Stuffed Peppers Tiberias, Fillet Massada and Negev Expedition (dates coated in a flour custard that includes green food coloring, for some reason). While some of them resemble things you’d find here, such as the stuffed peppers, the stuffed eggplant and the kebabs, others were created (and signed) by quite the creative chefs. 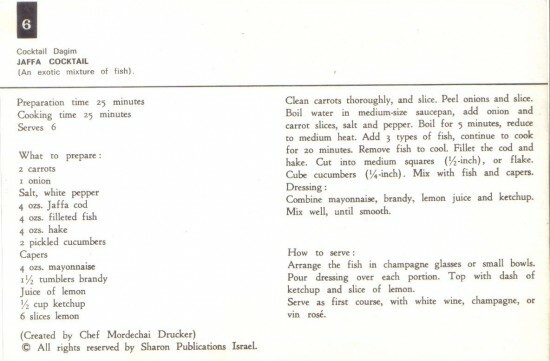 I wonder if any tourists ever believed that this is what Israelis eat, and worse, I wonder if anyone actually made some of these recipes. So with that, I’d like to wish my readers who fast a tsom kal, and for those who aren’t fasting, here are recipes for the Negev Expedition and the Jaffa Cocktail (click on them to enlarge). Disclaimer: don’t try this at home. 10 Responses to "For Yom Kippur: Here’s some motivation to fast"
Hilarious! Next time I make an exotic mixture of fish I may have the urge to add some green food coloring to it and stick it in a martini glass. Wishing you a tzom kal. But that stuffed avocado doesn’t sound so bad! Wishing you a tzom kal as well. Liz! Thanks for posting! I love those cards. You could create a contemporary art installation with those. I would frame them and hang them if I ever designed a kitschy room. Anyway – thanks, again – have an easy fast, and I hope you stop by tomorrow, if you can. I adore those recipes. And the photos. They really are awful, but sometimes I just do love the awful. Remind me sometime to show you an English book on Yemenite cookery that features the, um, virile parts of bulls, sheep, and goats. Talk about yuck. Your mother never heard of these and would definitely prefer fasting to eating them. I don’t even think your grandmother heared of them, and she visited Israel in the 70’s. Gefilte fish in a glass! What a riot! Besides the brandy, the ‘Jaffa cocktail’ is just a dressed up fish salad.. but don’t forget that at the time, more people ate things like jellied calf’s foot (×¨×’×œ ×§×¨×•×©×”), so I’m willing to believe anything. how funny, they do sound very 70ish. I also like the cookbooks published by passionate homecooks- the pictures are so endearingly unappetizing. Someone put their heart and soul into them and I can’t help but buy these ugly books. 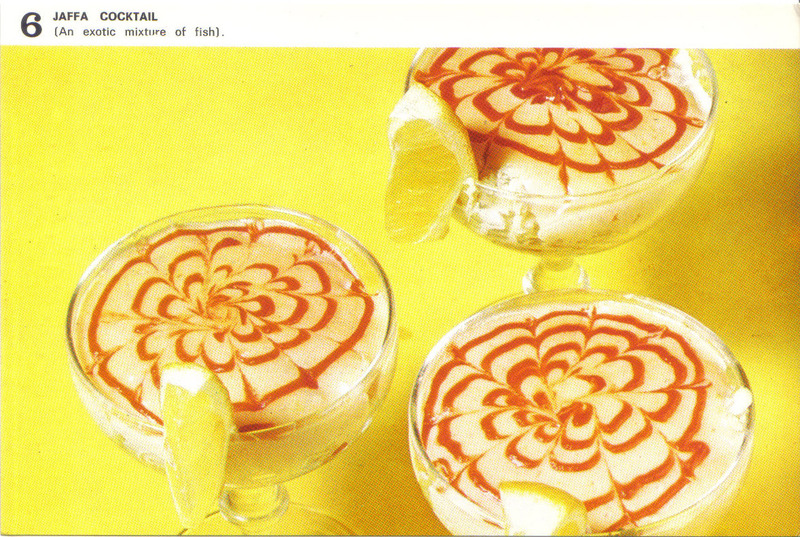 There is nothing redeeming about fish coctail a la Jaffa.